I've been wanting to add a new section to this blog for a long time. With all the snow we got this morning and Henry happily napping I figured I would take the jump and create a diet section. I vowed to blog more this year for me and something I love to do is cook. I made Henry's baby food from scratch and continue to dish up home cooked meals for the little man. With that being said in 2011 I really need to get a handle on our diet. I could stand to lose some weight and although Henry eats pretty healthy I need to kick it up a notch while he's still young. Remember how 2010 was all about denial? Yea well I started to slip on Henry's diet and ours and just treated him like a normal kid. This is not a good idea for tons of reasons. Henry's kidneys are working well now and our nutritionist encouraged us to feed Henry like any other normal child. However with the kidney issue and high blood pressure I know from reading that we need to minimize salt and cut back on protein. Protein is one of those things that the kidney has a hard time processing and the average american diet has just way too much of it. So I've made a goal this year to seek out lots of veggie rich recipes full of plant based proteins and nutrients. We still eat animal meat but I try to limit it to one or two meals a day. Plus the healthier we eat the better. So its a win win for all. 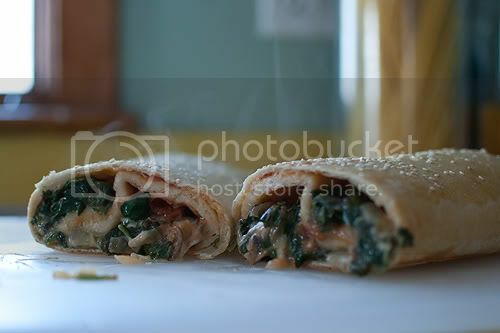 So today I made toddler approved spinach calzone (the full recipe is at the bottom of the post). I've never photographed the cooking process and it was interesting to say the least. I had fun doing it and can't wait to share more Henry approved recipes. I preheated the oven to 350 degrees and added 1 tbs of extra virgin olive oil to a skillet with the burner set to medium. Then I chopped up half an onion and placed it in the pan. I let it cook till the onions looked like they do below. 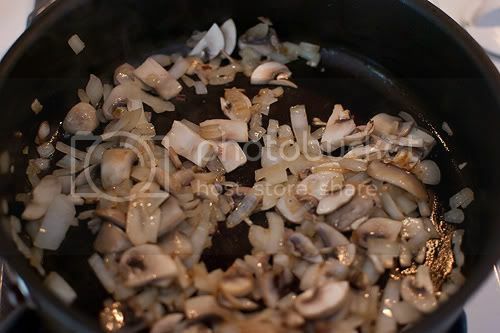 Next I chopped up 3 mushrooms and added those to the onions. I took the whole 5 oz package of baby spinach and added it to the skillet. It almost overflowed the pan but in less than 5 minutes it cooked down. By now the kitchen was smelling so yummy. I wish I had garlic on hand because that would have definitely made it into the pan as well. I turned the heat off on the burner and took 1 cup of shredded mozzarella cheese and added it to the onion, mushroom and spinach mixture. 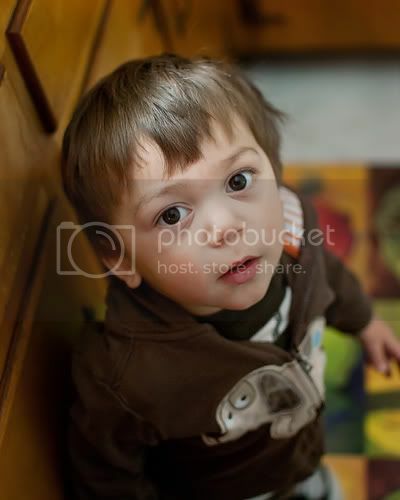 In case your wondering Henry woke up from his nap sometime before I rolled out the pizza dough and was right up under my feet begging to help so how could I not snap a picture of the little man. Now back to the cooking. 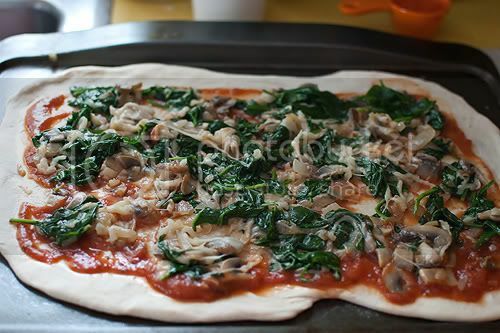 I placed 1 tablespoon of flour on a cutting board, flouring the rolling pin as well and rolled out the pizza dough into a rectangular shape. I should say rectangular loosely because as you can tell my rectangle is more of an ameba. I then transferred the dough to a cookie sheet that was sprayed with non-stick cooking spray. I was supposed to add 1/2 cup of pizza sauce but due to my little helper forgot and had to backtrack. (hence the remnants of spinach in the sauce but that is life with a toddler). Now onto the jelly roll part of the calzone. I fold 1/3 of the pizza crust over. Then tuck in the sides and fold over the last third. I used the egg, scrambled it and put an egg wash over the whole calzone. Then sprinkled the calzone with sesame seeds. Baked it in the oven for 25 minutes and it was done. When I cut it in half it smelled delicious and was all gooey and cheesy. I love how you can see the steam coming off the calzone. I cut a few pieces and henry and I dug in. How delicious does this look? It was so yummy and henry ate it up. 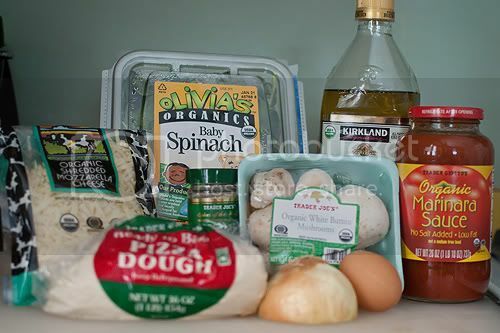 Even the spinach and lately green veggies have been on the the "no" list according to henry. So for the full recipe here you go. 3. Finely chop 1/2 onion and add it to the skillet. Cook until almost translucent. 4. Chop 3 large mushrooms and add them to the onions. Cook mixture for about 2 minutes. 5. 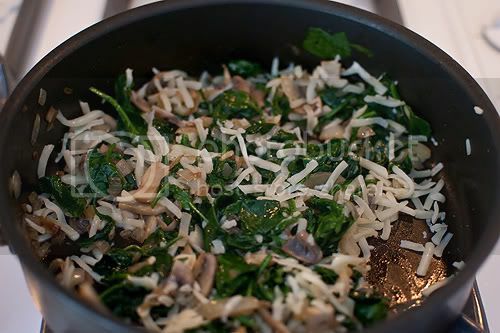 Add the package of baby spinach to the skillet and let cook until spinach has started to wilt. 6. Remove the skillet from the heat and add 1 cup of shredded mozzarella cheese to the skillet and mix everything together. 7. 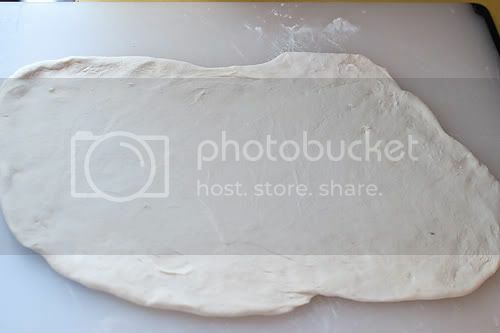 Place 1 Tbs of flour on a surface and roll out the pre-made pizza dough into a rectangle about the size of a half cookie sheet. 8. Spray the cookie sheet with non-stick spray and place rectangular dough on the cookie sheet. 9. 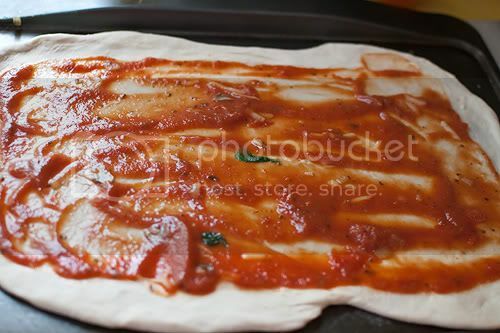 Spread 1/2 cup tomato sauce on the dough. 10. 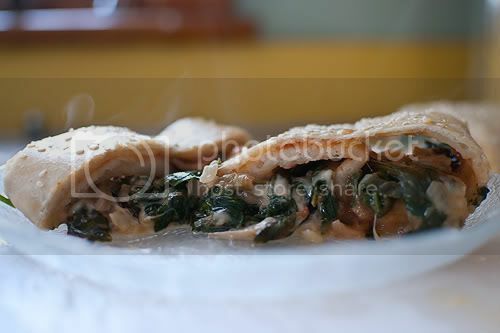 Spread the spinach, onion, mushroom and cheese mixture over the sauce. 11. 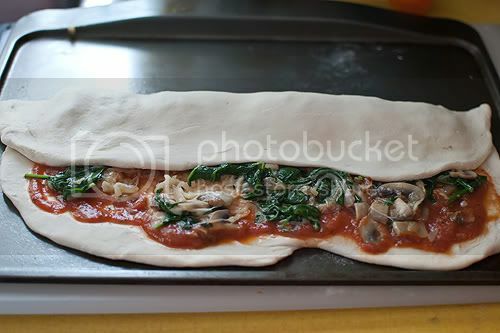 Roll the dough into a calzone shape. 12. Scramble 1 egg in a cup and brush it over the calzone. 15. Let cool and enjoy! Oh this looks soooooooooooooooo good. I will absolutely be making this myself! !